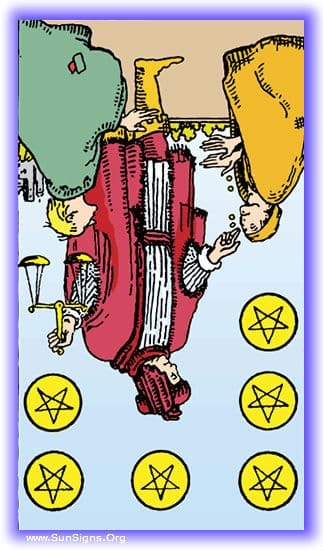 The Six of Pentacles tarot card represents the arrival of charity, or a time of generosity. When this card appears in the Minor Arcana, it shows that wealth will be shared evenly, and can represent our financial status finally coming into balance. We may not be wealthy, but our incoming wealth will at least match our bills at last. 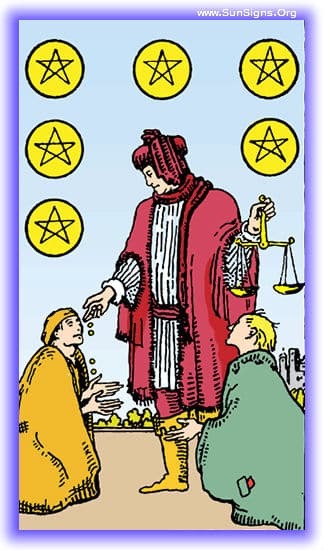 The arrival of the Six of Pentacles in a tarot reading indicates that generosity is going to play heavily into the current circumstances. These circumstances may involve you being the generous hand giving out wealth, or being on the receiving end of wealth to help you through your hard time. The wealth involved can include a wealth of wisdom or knowledge. You’ve been living on the generosity of another person, and it’s been helping you through this difficult time. It’s important for you to realize that this help is temporary, and while it has lent some ease to this time, it’s not going to last forever. There is someone in your life right now who is needing your generosity and assistance to get through a hard time. You’ve been on the fence about this, but know that it’s a good investment, they won’t take advantage of the situation, and it will pay off in the long run. You’ve been struggling, doing everything you can, but you aren’t quite making the cut. Do not fear, there is an ease coming in your future. Someone will be offering you help to see you through your difficulties. It’s not a long term solution, but they’ll offer it without resentment. The arrival of the Six of Pentacles is a warning, representing that you are dubious about the prospects of money lent out being returned. Know that if you are in financial trouble, this is a sign that now is not the time to be generous, but to hold on to what you have. This can also represent a problem with debt, and a tendency to dig yourself into it. At it’s worse it represents charity with strings attached, more than the simple expectation of repayment. You’ve been having trouble hanging on to your money, so many hands and such a big heart has had you giving it out, or those credit cards have been just a little more tempting than you’ve been able to avoid. Someone is petitioning to borrow money from you, and this is a warning against meeting them on this and actually loaning the money. If you do, do so with the knowledge that they won’t be paying it back anything like on time. There is money that you’ve lent out that you’re expecting to see back. This is a warning to prepare for the eventuality that it won’t. Something is going to happen that will overcome the person’s best intentions of repaying you.